Considering getting a German Wirehaired Pointer? 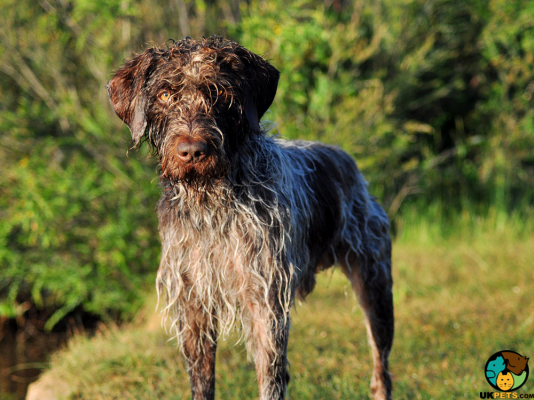 The German Wirehaired Pointer (GWP) originated in Germany, as the name suggests. This breed was developed in the late 19th century as a hunting dog. It excels in hunting any water or land game and at the same time is an excellent companion dog for families with an active lifestyle. 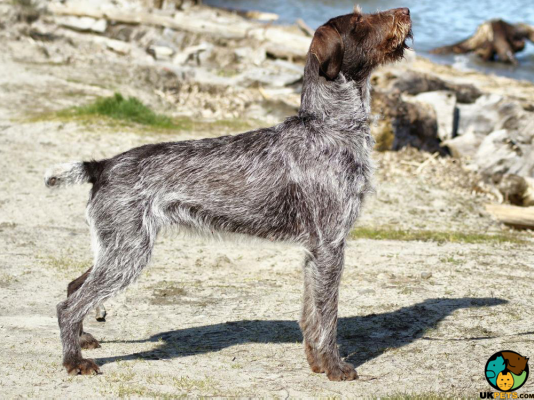 Standing 56 to 67 centimetres at the withers and weighing 60 to 70 pounds, the GWP is slightly taller and heavier than its cousin, the German Shorthaired Pointer. It has an expected lifespan of 12 to 14 years. Open your home to this beautifully balanced dog breed. See all German wirehaired pointer characteristics and background below. The German Wirehaired Pointer (GWP), often referred to as Drahthaar, is a known bird dog from Germany. It was originally bred in the 1800s by German hunters looking for a rugged-looking dog that can hunt game-birds on any terrain. Contributing to its lineage and its qualities are the Poodle, the Foxhound, and the Pointer (believed to be the earliest version of the German Shorthaired Pointer). In 1928, the German Kartell for dogs admitted and recognised the GWP. About the same period, the breed was imported to the United States and later, the German Drahthaar Club of America was formed in 1953. In 1959, the German Wirehaired Shorthaired Pointer was recognised by the American Kennel Club, when the parent club was changed to officially become the German Wirehaired Pointer Club of America. The United Kennel Club recognised the breed in 1948. The German Wirehaired Pointer is a naturally built pointer: nicely balanced, well-muscled, tough, alert, and generally developed to hunt in rough terrains all day long. One of its trademarks is its harsh wire coat that protects against thorny brushwood and bad weather. Another distinct feature is its bushy full beard and eyebrows, which are typical of many German breeds, adding to its intelligent and knowing expression. It closely resembles its cousin, the German Shorthaired Pointer, except that it is larger, longer and with a wiry coat. The GWP stands 56 to 67 centimetres at the withers and weighs 60 to 70 pounds. When it comes to details of its physical appearance, the GWP is well-proportioned withslightly rounded broad heads. It has a moderate stop with muzzles the same length as its skull. Its eyes are medium-sized, oval shaped with a nice dark colour. Likewise, the ears are medium-sized set high on the GWPs head. Necks have nice slopes that add to its powerful appearance, together with well-muscled shoulders and well-sprung, deep ribs. No doubt the GWP is an athletic-looking dog breed with its firm backs and muscular front legs. The German Wirehaired Pointer sports a functional double coat that is water and weather resistant. The coat is comprised of a very dense, harsh and wiry outer coat and soft and thick undercoat. Accepted breed colours are liver and white, solid liver, black and white and solid black. Matching its coat colours are a liver-coloured nose and lips. In the grooming front, the GWP's coat is low maintenance but should remain clean with regular brushing. Its coat sheds minimally all year-round and is water-repellent, so bathe him only as needed. Routinely trim the nails to avoid painful overgrowth. Brush its teeth at least twice to thrice times in a week to remove tartar build-up and gum disease. Its ears should also be checked for any signs of infection such as redness or bad odour. The German Wirehaired Pointer is a remarkable looking dog breed that is known to be gentle and affectionate. It is people-oriented that enjoys human companionship and likes nothing more than to be a part of a family. The GWP is a bit mischievous and often clownish as it seeks attention from people. Since it is a gundog, bred to be a hunting companion, the GWP is happiest when it is out in the field. It doesn't complain when it gets praises, treats and belly rubs inside the home. This type of dog breed is extremely loyal and protective. It is a little wary around strangers but rarely exhibits any aggressive behaviour and will prefer to keep its distance. This makes it an excellent watchdog. GWPs aren't the best choice for families with toddlers but will do well with older children willing to play outdoors who can stand up to its size and keep up with its energy levels. Still, strict supervision by an adult is essential for the safety of both. When it comes to other animals, German Wirehaired Pointers may be aggressive toward other dogs but can coexist with them when raised together, including cats. The German Wirehaired Pointer is a good choice for new dog owners because of its kind nature and people-pleasing temperament. However, the owner must be prepared to spend a lot of time with the breed, giving it an adequate amount of physical and mental stimulation. Early socialisation is crucial, as it is with any dog breed, to curb negative habits and make it a well-adjusted dog. A typical serving for an adult German Wirehaired Pointer is 2.5 to 3 cups of premium dry dog food daily. Make sure feeding is divided into two meals – morning and afternoon. However, don't rely too much on information you find online, best to consult with a veterinarian since each dog has different nutritional requirements depending on its size, age, metabolism, health, and activity level. Feed your German Wirehaired Pointer a nutritious meal that lists meat as the first ingredient. It is also recommended to feed the dog with homemade diet composed of protein, fats, fibre, vitamins, and minerals for a well-balanced diet. The German Wirehaired Pointer is generally healthy. If properly cared for and given the right amount of exercise and balanced diet, it can live up to 12 to 14 years. Regardless, it pays to consult a veterinarian to make sure it doesn’t develop certain genetic diseases such as Hip Dysplasia, Entropion, Cataracts, and Von Willebrand's Disease. 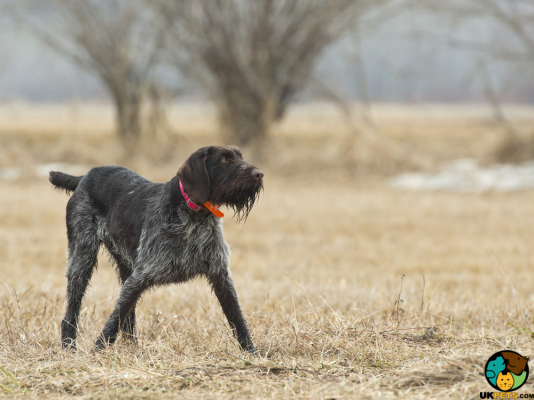 The GWP is an active, outdoor breed requiring adequate amount of exercise of at least 2 hours daily. Keep it busy with tasks or some mentally stimulating activities to avoid boredom and becoming high-strung and destructive. With this said, German Wirehaired Pointers are best suited with families committed to an active and outdoorsy lifestyle. When outdoors, make sure they are on a leash or when off-leash they must be within a securely fenced yard. If you are looking to own a German Wirehaired Pointer, prepare to pay anything from £550 to over £750. Besides, you will have to register and be on a waitlist since only very few puppies are bred and registered every year. When it comes to insuring a GWP, you will have to budget £21.87 to £57.54. Pet insurance companies will base its premium cost calculations on your location, the dog's age and whether the dog has been spayed. Spending for dog food constitutes a large part of the costs, with the best quality dog food for a GWP costing around £40 - £50 a month. On top of all this, routine veterinary consultations including the initial vaccination, boosters and spaying will cost you £1,200 per year. In estimate, the average cost to raise a German Wirehaired Pointer is anywhere from £70 to £120 a month, depending on the insurance you choose to avail. 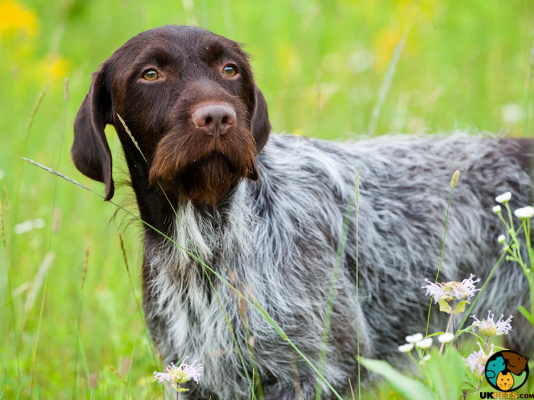 Is a German Wirehaired Pointer Right for You? GWPs are active breeds best suited for families committed to an active lifestyle. It can coexist with dogs and cats only when they are raised alongside it. It is low maintenance on the grooming front. It is incredibly loyal and protective and is an excellent watchdog. GWPs require at least 2 hours of rigorous exercise.